What made US diplomats in Cuba and China severely sick over the past two years? We still don’t know for sure. But US officials now suspect that the Russian government might have had something to do with it. At least that’s the theory being floated by anonymous sources to NBC News. The theory that Russia is behind the attacks, which has resulted in some diplomats experiencing permanent brain damage, is reportedly based on signals intelligence (SIGINT) collected by the FBI, CIA and other unnamed intelligence agencies. SIGINT can include everything from text messages and voice calls to Morse code and radio waves, but the new report from NBC News doesn’t specify what may have been intercepted. The earliest theories for what injured the American diplomats in Cuba and China was that some kind of sonic device was operating on a frequency that causes brain damage. But officials now believe that the suspected weapon used some other kind of directed energy technology like microwave radiation. Directed energy, including things such as lasers and sonic weapons, are dangerous on the battlefield because there’s absolutely no warning before an adversary uses it. Defending against something like a missile is relatively easier because it can be detected using modern defence technology once it’s in the air. The precise motive remains unclear, but the incidents have driven a wedge between the US and Cuba that has led Washington to remove most of its diplomats and spies from the island. Early in the investigation, senior US officials raised the possibility the illnesses were unintended consequences of some new spying technology. But the fact the incidents continued long after they became publicly known has cast doubt on the possibility that the damage was accidental. The report makes sure to hedge that American intelligence officials haven’t been able to conclusively say that Russian intel services are behind the attacks, but as US and Russian relations continue to deteriorate theories about Russian involvement certainly become more believable. The United States pulled most of its diplomatic staff out of Cuba last year after the mysterious illnesses that were experienced by 26 American personnel. And relations between the two countries, which had thawed at the tail end of the Obama presidency, are back on ice. Cuba has repeatedly denied that it was behind the attacks. One American worker in Guangzhou, China started making similar complaints earlier this year, causing even more mystery about what was behind these “attacks”. US State Department officials now get hazard pay for working in Cuba. If it really is Russia behind these attacks, it’s unclear how the US State Department will react. 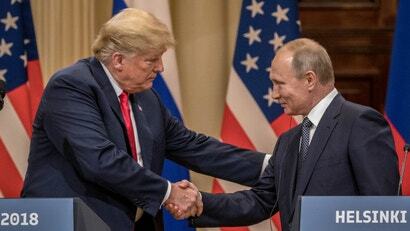 But given President Trump’s cosiness with Russian President Vladimir Putin, you can bet that Trump will probably try to thwart any real retaliation. That is, assuming Trump’s team even bothers consulting him. No one really knows who’s in charge in the White House any more. And that’s nearly as terrifying as the prospect of Russian spy operations on American soil.